Dry fly season is here. Time to grab your favorite PMD and caddis dries and hit the river. Our Montana fly fishing guides have been busy at work on the Missouri River teaching anglers how to get it done. River flows have been a roller coaster ride for the past week on the Missouri and Madison Rivers but are looking to be on the drop in the next week as the recent storms have moved on. The Missouri and Madison Rivers as well as the Paradise Valley Spring Creeks will continue to be the best options for anglers in and around Bozeman, Montana for the near future, but our local freestones are on the drop and will be clearing in the next 2-3 weeks. Dryflies, nymphs, and streamer fishing will all be great as we move out of spring and into summer. Salmonflies will be flying before you know it. Read on for more details. Flows are above 15000 CFS after this last storm cycle but will start to drop this week as the Dearborn River and Little Prickly Pear creek return to normal flows. Fishing will be great from the Dam all the way to Cascade. We have seen daily hatches of PMDs, Caddisflies, Yellowsallies, and the appearance of some terrestrials. Dryfly fishing was great prior to the river rising and will return to greatness by the end of this week pending more rain. Find a fish, pick your favorite pattern, and make your first cast count. Cripples are the key to getting it done while the fish are still fresh. Spinner will follow after they get casted over a few times. Don’t be afraid to think outside the box too and fish smaller terrestrials. Nymphing on the upper river has continued to produce good numbers of great sized fish. As the river clears and the canyon opens up again nymphing deep, shallow, and medium will get it done. Big attractors have been our top flies and smaller mayflies or sows have been our bottom. Want in on the action? Give us a call at 406-579-9553. Still running high but on the drop. We are hoping to be fishing by July 15. We see lots of anglers and floaters on the river before the river clears every year and there are fish to be caught, but the Yellowstone River is a big river above 10000 CFS and should be floated with caution. Always respect the water. Recent storms have meant a big increase in flows on the Madison River but fishing has remained solid and will only get better as flows drop this week. Nymphing and streamer fishing has been consistently good with larger stonefly nymphs, worms, crayfish, and larger caddis imitations being our top producers. Salmonflies are right around the corner and will be seen in Ennis by the end of June. Big browns love the big bug. Get our early and stay out late. The Salmonfly hatch isn’t a secret on the Madison River and usually means big crowds but for good reason. The hatch is some of the best early summer big dry fly fishing of the year near Bozeman, Montana. Pick your favorite big dry, fish it well, and the fish will follow. The fish aren’t always keyed in on the salmonflies and tend to get gorged some days but if you stick with it, you will get your shots. Hard to beat fishing dryflies on 1x tippet. The PMD hatch is here. Rods availability is almost non-existent but if you already have a reservation you will be in for a treat. 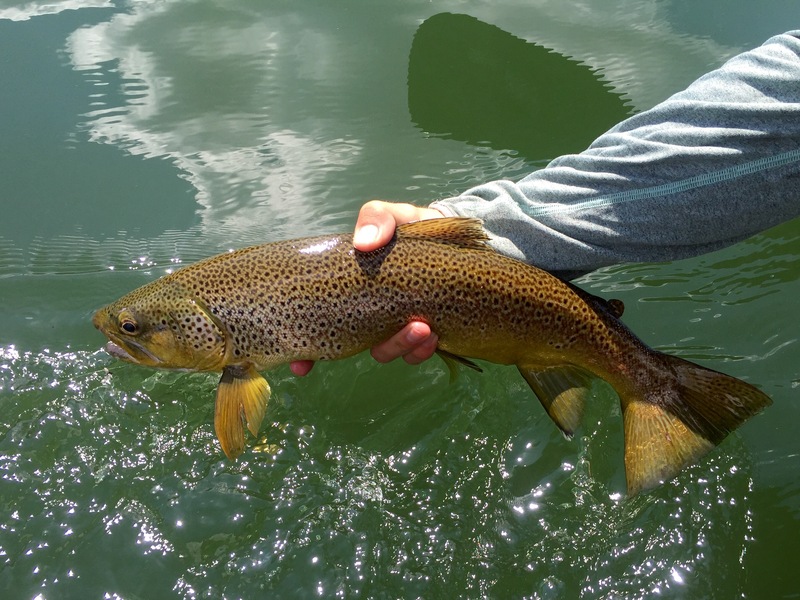 The hatch will continue through early-mid July and make for great technical dryfly fishing. The fish get savvier with each day, be sure to bring a variety of emergers, cripples, and spinners. Match the hatch for success. And don’t be afraid to downsize. Stay out late for the spinner fall. Try fishing a small terrestrial before the hatch to keep the mornings interesting. Be sure to have your spot staked when the bugs start hatching and work the fish in front of you. Fish slow and make your first cast count. Early season fishing on the Firehole, Madison, and Gibbon Rivers in Yellowstone Park has been great. Recent storms meant high flows and tougher conditions but fishing will be good again this week. Daily hatches of caddisflies makes for great early season fishing. There is a wide variety of sizes and colors so come well stocked with your favorites in #12-#18. We like X-Caddis. They are a classic pattern that consistently produce. The Northeastern rivers continue to run high an muddy. Check back in mid-July for fishing information regarding the Lamar River, Yellowstone River, Soda Butte Creek, and Slough Creek once flows subside.